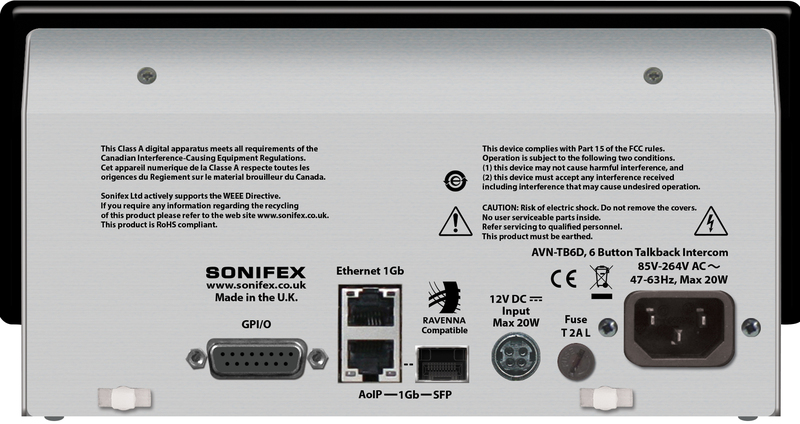 The AVN-TB6D is a 6 channel talkback intercom control unit from the Sonifex AVN range of IP based products. The AVN-TB6D is a desktop version which can be fitted flush into a work surface if required. There is also a freestanding version which can be rackmounted with the AVN-TB6RK 1U rack kit. Both models offers similar functionality. This unit provides broadcast quality audio communication between studios, offices and different areas in a facility or building complex, using RAVENNA/AES67 as the transport mechanism, allowing simple CAT 5 cabling and expansion. RAVENNA (of which AES67 is a subset) allows for the distribution of audio across a network. The AVN range use RAVENNA as the communication method providing compatibility with other AES67 systems. Each of the 6 channels on the AVN-TB6D can be configured to provide communications with other remote networked units, and an independently configurable ‘page’ function can contact selected units with priority over standard intercom calls if required. There is a monitor channel that can route the audio from an AoIP source to the headphones and speaker. This could be used to take an IFB feed or an off-air transmission signal or simply to listen to any audio source. A user configurable GPIO system, with 10 physical ports and 10 virtual ports, can be used to control operational functions on local or networked units, or drive outputs as selected states change, and a voltage free relay contact can be used to operate external equipment. A built-in web server provides complete configuration control of the units and also allows for firmware updates and configuration backup. An Ember+ interface also gives access to the configuration options as well as providing remote control and monitoring of the GPIO and virtual GPIO ports. The AVN-TB6D has a built-in webserver for setup and configuration. The webserver is responsive, and resizes depending on the size of your screen, meaning that it can be used on large monitors or small handheld devices such as smart-phones. Help information is shown on the right hand side of the screen so it’s a good place to go to find out how the unit operates. 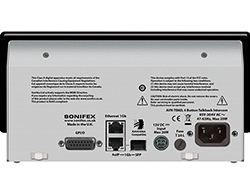 Product Function: Provides broadcast quality audio communication using RAVENNA/AES67 as the transport mechanism, allowing simple CAT 5 cabling and expansion. 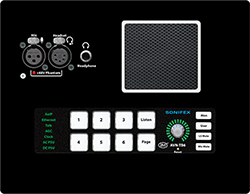 Typical Applications: Ideal for broadcast quality audio communication between studios, offices and different areas in a facility or building complex. 6 illuminated key-cap Talk buttons plus Listen & Page buttons. 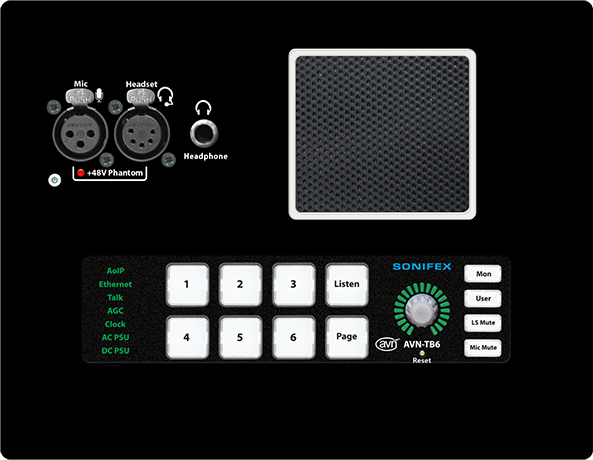 Mic & headset inputs, headphone & speaker outputs with volume control. Loudspeaker & Mic Mute buttons. Advanced echo cancellation & mic AGC to prevent acoustic feedback. AVN-TB6RK 19” rack kit available.